The Skashank Redemption – To Victory! I miss the days of 3rd wave ska. I’m pretty sure that any other fun lovin’, skankin’, also liken punk sorta folks feel the same. Well I’ll be damned if life doesn’t sometimes provide it’s own time machine, ‘cause ska (in a decidedly 3rd wave variety) is making its rounds again. I’m listening to “To Victory!” the new E.P. 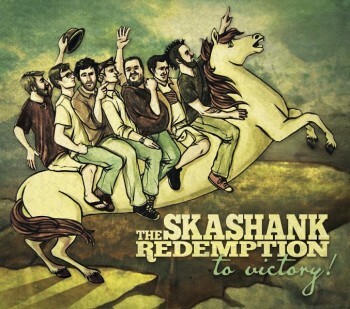 by The Skashank Redemption (not to be confused with The Skaskank Redemption … I know, confusing, right?) but I digress. These boys, Skashank, not Skaskank are from the bustling, 14th largest city in the USA, Columbus, OH. Maybe there’s something about the midwest? The beer, the weather, the sassy ladies? There’s something that brings out the pep in the horns, the plink of the strings and the silly antics of high number of member bands. The only detractor for me are a bit too much of the joke banter. Some folks may like it. I’m not a fan. That aside, a solid release.